Kim’s the trendsetter, Khloe is the fitness queen, Kylie has the billion-dollar make-up empire and Kris is the momager that holds it all together. But it’s Kourtney’s interior talents that interest us the most. With every episode of Keeping Up with the Kardashians, we’ve found ourselves less interest in the latest family drama with Scott Disick and more interested in Kourt’s sprawling mansion, her bold yet simplistic interior styling and her impressive taste in statement furniture. Yes, somewhere along the way, the oldest Kardashian has grown into an interior design genius. The mum of three purchased her gorgeous home in Calabasas, California in 2014 for £6.5 million ($8.5m). The exquisite property boasts 12,000 square feet and sits within 1.86 acres in an ultra-exclusive gated community. Featuring a home cinema, spa, sauna, sports court, and gigantic swimming pool, plus six luxurious bedrooms and numerous impeccably-designed living spaces, this is one home we can’t stop drooling over. Surprisingly, the reality star has said this room isn’t supposed to be comfortable, insisting it’s more of an entertaining space to host guests. 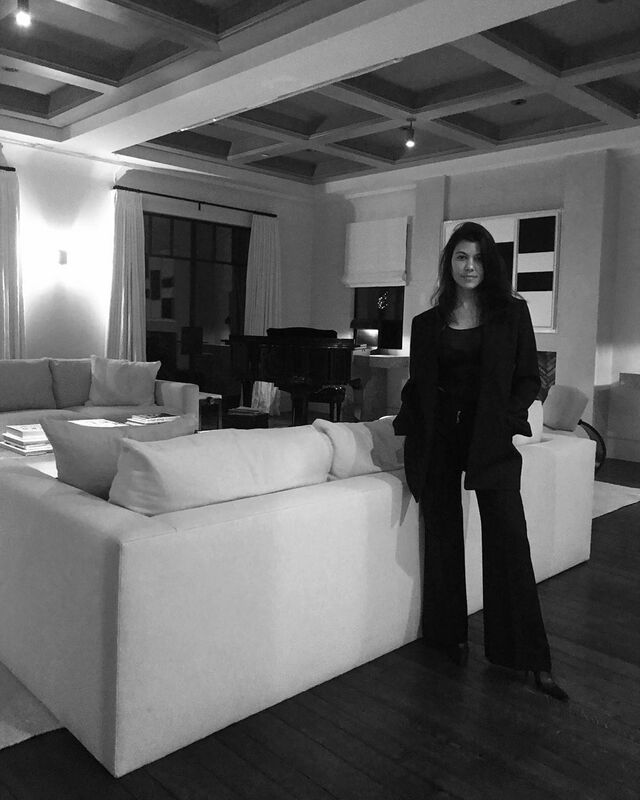 On her new website, Poosh, Kourtney recommends investing in coffee table books, saying: "One of the easiest ways to decorate your space is to display your collection of books. 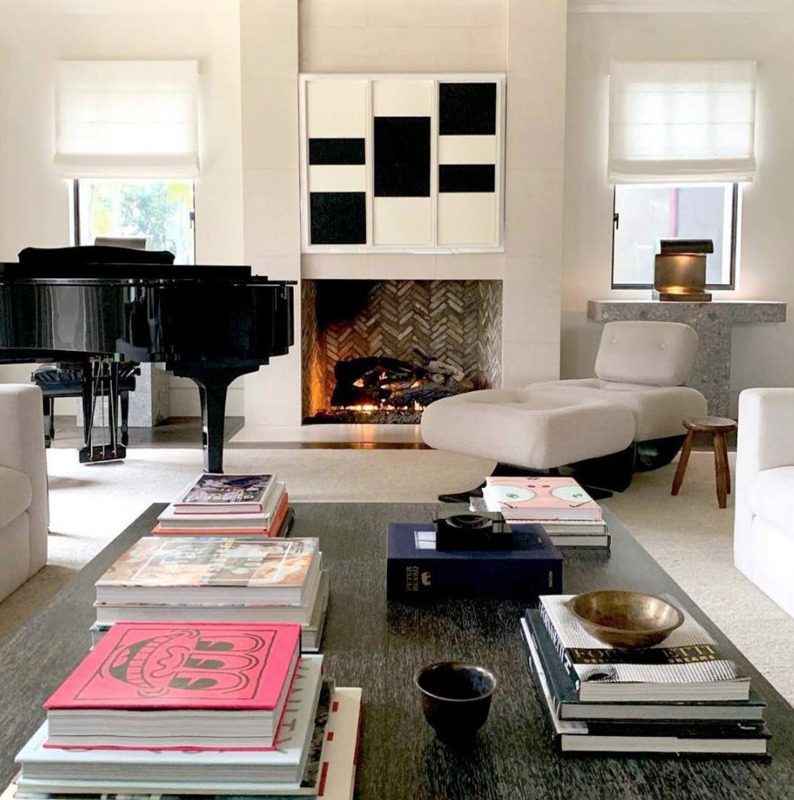 Whether your interior style is simple and sleek or modern and eclectic, arranging your most colorful and classic reads on your coffee table will instantly (and effortlessly) update the room". The bathroom is that sacred part of the home where you can really relax, whether it’s indulging in a long hot bath, standing under the shower for those few extra minutes in the morning, or pampering yourself with a face mask after a long day. When it comes to creating a tranquil space, the eldest Kardashian has got it in the bag. Shelves of neatly folded towels, chic dark wood furniture and a scattering of luxury beauty products really give this room a decadent feel. On Poosh, Kourt advises: "If you’re looking for a room in your house to refresh without too much effort, choose your bathroom. The area is typically small enough that even a subtle tweak can make a major difference. Stocking your lavatory with pretty soap, soft scents, and a dash of greenery are only a few ways to add an elevated feel to the space." She's not afraid to embrace quirky pieces either. We love these playful graphic prints, not to mention the unusual Batman portrait. 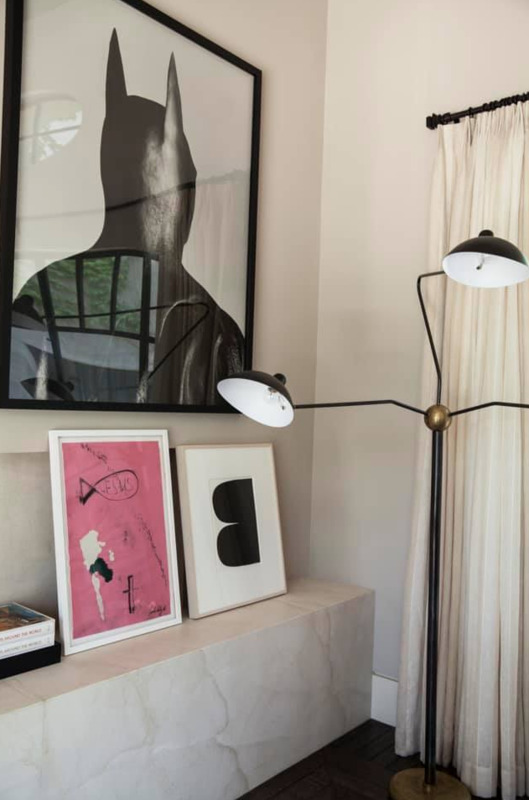 Paired with an architectural floor light and marble shelving, Kourtney’s office balances chic finishes with hints of humour. Who says the area you work in has to be cold and dull? Inject some personality into your home office by showing-off statement art or displaying objects that make you smile on floating shelves. It might even push you to be more creative. Enough said really, Tom Dixon is amazing. 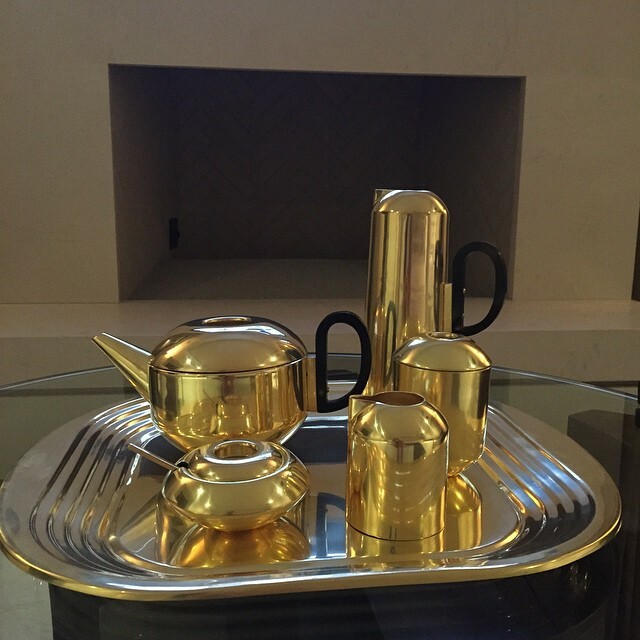 Writing on Instagram, Kourt, who turns 40 this month, said: "I thought my love affair with brass was over and then this #tomdixon tea set came into my life and brass and I are BACK ON!" Personally, we’ve never fallen out of love with brass – it can be worked into almost every interior style, looks impossibly chic and really draws the eye. If you can’t stretch to the tea set (the teapot alone is £170), we love Tom Dixon’s brass room diffusers to add a little luxe. Plus they smell divine. A calming, muted space, Kourtney has expertly paired neutral tones with natural wooden accents in this bedroom. "The secret to making your bedroom look swanky starts with a clutter-free space," she explains. Tactile light grey carpet adds softness – especially important in a bedroom – while floor-length curtains can be pulled over the TV and windows to create a cosy private space. 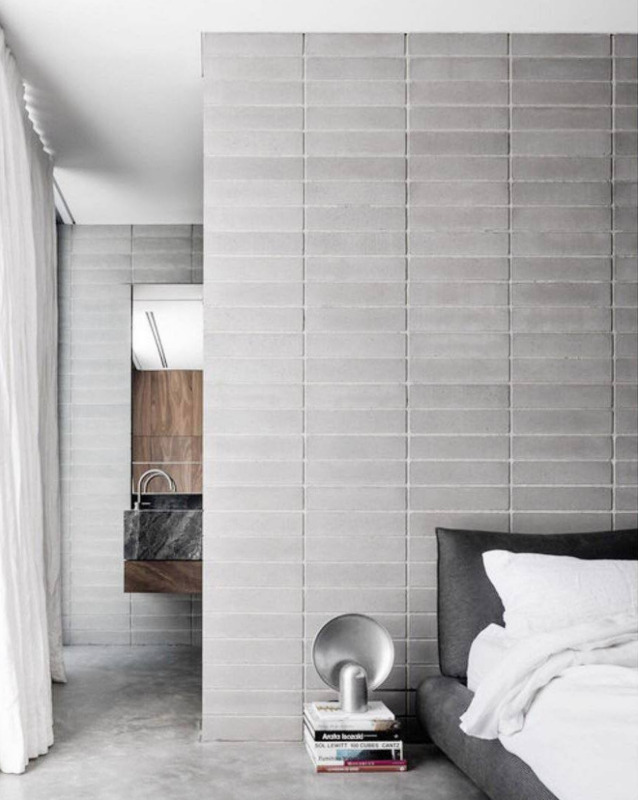 Organic bedding is a must for Kourt, who uses Legna linens throughout her bedrooms, while a simple glass carafe is great for a guest bedroom and an easy way to limit plastic usage. If you want to emulate Kourtney's calm and tidy space, check out our ultimate decluttering tips. She might know how to work a neutral palette, but Kourtney certainly isn’t afraid of the colour wheel. 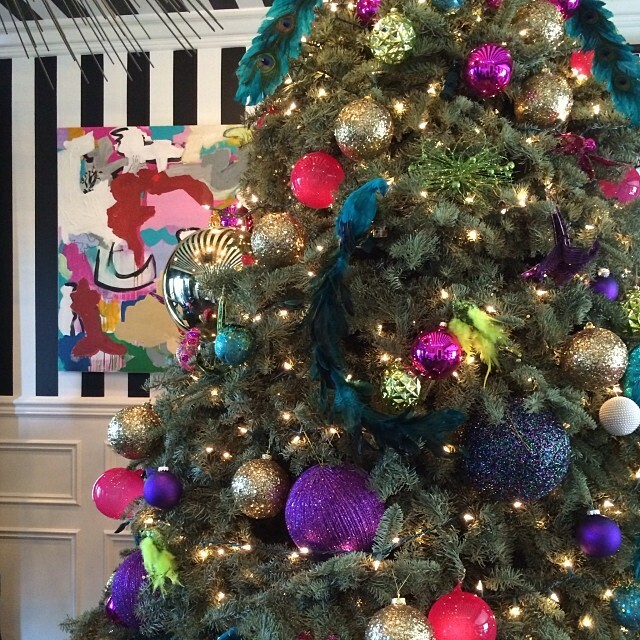 Rewind to December and her Christmas tree was a riot of colour, adorned with opulent gold ornaments, glittery baubles and handsome peacocks. Offset against a dramatic striped wallpaper, that quirky and colourful wall canvas is giving us quirky street art vibes too. Set amongst manicured green lawns, rows of matching sun loungers and large leafy trees, Kourtney knows a thing or two about alfresco glamour. The indoor-outdoor living area she’s created is particularly sociable, with a covered breakfast bar, kitchen, and cute marble tables – the perfect cocktail spot after a dip in that gorgeous pool. Maybe it’s the expertise that comes with living in the lap of luxury or being on the wave of every breaking trend, but Kourtney just knows what works. These crisp white sofas are a daring style statement and we're 100% onboard. If you’re loving them as much as us, get in on the action with these similar designs from Ikea. All in all, we’ve yet to see Kourt put a stiletto-clad foot wrong when it comes to interior design – we’d happily move into that dreamy mansion tomorrow!